Rocketship was founded by John Danner, a 45-year-old Silicon Valley entrepreneur and onetime public school teacher. Their schools are bridging the achievement gap, the difference in academic performance between poor and privileged children. The gap influences the path a young life takes. Poor children are likely to enter school already behind, never catch up and then drop out. This has a huge impact on their economic future. Rocketship has very good results with “low income” kids, they are praised by their “new” way of educating. This is because Danner believes he has found a way to conquer this problem. On standardized tests, Rocketship students have outscored the county and state average. In some cases, the “Rocketeers” have performed as well as students in nearby Palo Alto public schools, where Stanford University professors send their children. Danner wants to take his model and expand it into the nation’s largest chain of charter schools, reaching 50 cities by 2020. Rocketship only focusses on K-5 schools, because they believe that students in grade 1-5 are still able to bridge the gap. A few weeks ago I finally had the chance to visit one of their schools in San Jose. The Rocketship school year extends the average school year by 3 weeks. But, where California has a yearly minimum of 180 schooldays, Rocketship kids go to school only 2 extra days per year. So why these 3 weeks? Rocketship believes that teachers need one day per month to prepare their lessons for the next month. In most schools teachers use August to prepare the entire year. Rocketship believes that it is not possible to do all your preparations in August . So, every month the students have one day off. This day is used by their teachers to prepare the lessons for the next month. Every teacher is coached by a professional at least once every two weeks. When coached the teacher will wear a headset during class. A coach (sometimes the principal) will sit in the back of the class and communicate with the teacher while he/she is standing in front of the class. Over the last 5 years they have found that this helps teachers and increases student results. Teachers earn 15% more than the average teacher. Within a few years they want the average teacher salary for their schools to be $100,000 (these schools are still public schools; you do not have to pay extra tuition as a parent). They see that many schools have problems keeping great teachers. After a few year in education outstanding teachers tend to pursue careers in the corporate world, in order to fulfill other personal goals (a nice house, a nice holiday). Rocketship wants to prevent these teachers from leaving by offering competitive salaries. They have a system by which they can monitor the student results. Teachers are rewarded when their students perform above average. Good teachers earn more than bad teachers. An interesting model, which has been talked about for a long time. Rocketship implemented it and it seems to work. 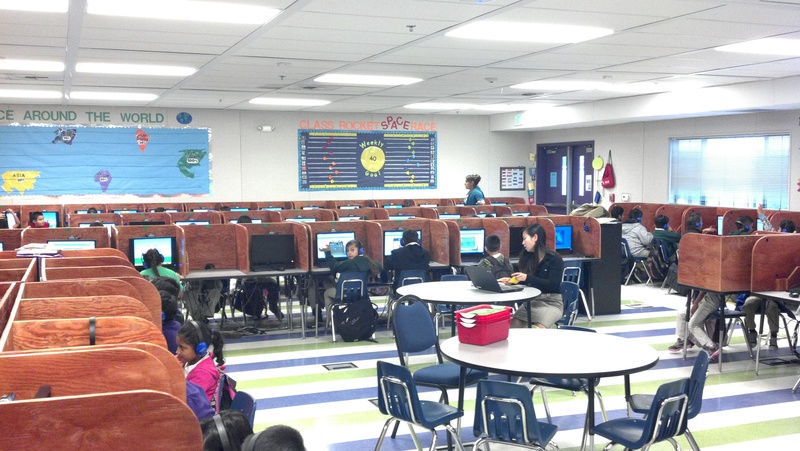 Their students spent 2 hours a day in the computer lab. The lab consists of 130 PCs, the only software on the PCs is Windows (they use the OEM version that came with the PC, I have seen Windows XP, Vista and 7), flash and a browser. That is all they need because all their educational apps are cloud based. The computer lab is staffed by 6 trainers (not teachers). These trainers help the kids when they struggle with their assignments, special software analyses the student results while working on the PC. According to California state law the 2 hours the kids spend in the computer lab are not seen as education. So Rocketship students have longer schooldays than others, they start at 8AM and finish at 4PM (2 hours more than most other K-5 schools). So how are they able to do all this without extra funding from the parents? The answer is in the computer lab and the longer hours. While the kids are in the computer lab, their teachers teach other classes. A teacher teaches 4 classes a day. They have a system they call rotation. So they need fewer teachers than other schools, but because of the coaching and the way they analyze results in the computer lab they still get better results than other schools. They make “a revenue” (yes, their principal talks like a businessman) of $ 500,000 a year because of this. They invest this money in teacher salaries, coaching and other educational tools. Besides that they expect parents to do a minimum of 30 hours of volunteering per year. This sounds like a lot but so far this has never been a problem. Parents are so grateful for the level of education their kids receive that they do not mind spending 30 hours a year at school. All in all a very interesting school system. I have seen quite a few articles about this school where their model is compared to the flipped classroom or blended learning. The people from Rocketship that I met have a different point of view. They do not see this as flipped or blended. They just believe that they have a different approach with their students as well as with their teachers. This combination makes this a very powerful system. For me and for DirAction USA it was interesting to see that this school does not use Microsoft in the way that we, as a Microsoft partner, hope they would. They don’t use Adobe nor do they use laptops in their classrooms. They have a 130 PC computer lab and pay for a few educational apps; all the other things are seen as not important. The 130 PCs in the computer lab are kept as simple as possible. They have 6 schools in the Silicon Valley region, every school has 130 PCs in their lab. The maintenance for all these PCs is done by 2 college students that they hire on a part-time base. If you only use the Microsoft OEM software and a browser I can imagine that you do not need much software for your PCs. So, software licensing is not as important for Rocketship as we as a reseller would like to see. However, their computer lab is very important. And that is why it is good to know that we, besides our Classmate PC and software solutions, also focus on computer lab solutions. Just as affordable as all our other products and easy to maintain. All in all I must say that this was one of the more amazing schools I have visited over the last few years, it will be interesting to see what the future will bring for them.